The tool that we are going to use is as important as the project that we are making. When we are doing something, we need the most appropriate machine that will perform the applications that we need. 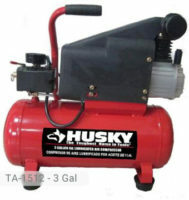 Husky 6 Gallon Air Compressor TA-1524P is one of those units that can be used for several purposes. With its industrial-style induction motor, it can provide a high-quality performance that other models are unable to do so. It can last up to 3 times longer than the standard air compressors in the market right now. With its pump, it can deliver 2.5 SCFM of air at 90 psi. The maximum pressure is at 135 psi. This unit will work best for certain applications such as inflating, cleaning, and powering nail guns. 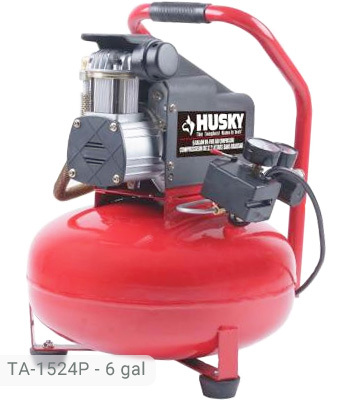 The tank has a 6-gallon capacity which is just enough for DIY projects and light-duty applications such as, but are not limited to, the following: air blowing, finish nailing, inflation for automotive purposes, spraying, hobby nailing, painting, and many more. 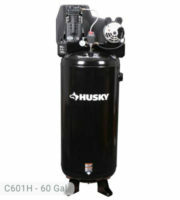 With additional air tank you can get even more compressed air. and sealant tape that can piece together all the necessary components. These accessories are all reliable and can be perfectly used with the air compressor. If bought individually, these stuff can cost you more. The pump is oil free so there is no need for additional maintenance activities such as changing of oil. It is a low-maintenance unit that only needs to be thoroughly checked after using it for hundreds of hours. For an extended pump life, there is an installed air filter made of steel which can be used to trap dust, particulates, and other contaminants that can clogs tubes and fittings. The filter element can be replaced easily. 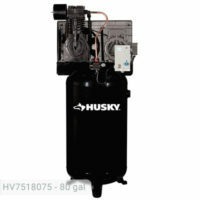 This Husky 6 gal air compressor is very portable because it only weighs 49.6 lbs. It has a handle that provides a good grip of the machine. The rubber feet also make it stable and well-balanced when mounted on a specific surface and location. The tank is circular in shape and is not as slim as the other tanks. However, with a height of only 22 inches and a width of 16 inches, it will not take too much space in the garage. It works quietly as compared to other tanks with the same capacity. To start its operations, you would need a 120-volt power outlet where you can plug it in. 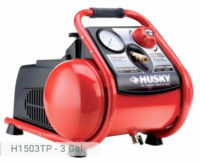 Husky 6-Gal Portable Electric Air Compressor is very cheap considering that it has an accessory kit which is included in the package. 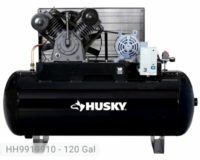 If you will be using an air compressor mainly for domestic purposes, this is the perfect model to use. It is not too basic and not too complex so it is appropriate for home owners. If you already own Husky TA-1524P model or just want to buy it, feel free to share your review or ask a question through the form below. Can this compressor air-powered 1/2″ impact wrench SCFM – 3.790PSI for season tire changes?